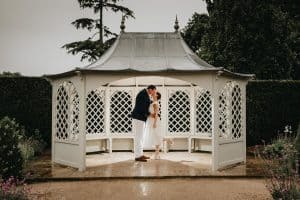 WINTER WEDDING TIPS FOR GREAT PHOTOS | DON’T LET RAIN STOP YOU! 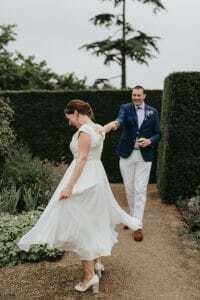 I’ve put together this handy guide of Winter wedding tips because a common concern for many brides and grooms when booking a winter wedding is the unpredictable weather. “We’re worried about achieving great couple and group photographs in winter time – how do we beat the weather and get winning shots?” Winter weddings should not be a daunting thought so I have put together a list of my top Winter wedding tips for ensuring that your winter wedding flows as smoothly as it would in the summertime. 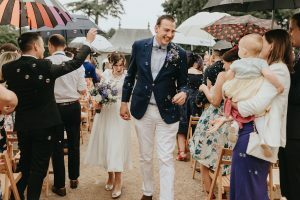 The images accompanying this blog post are that of Sarah + Dean’s Marks Hall wedding as it was such a great example of not letting the weather ruin your day – the rain poured yet they still went ahead with their planned BBQ and Summer feast. My biggest of these Winter wedding tips would be to embrace the winter season! Don’t let bad weather get you down, there are numerous things you can do that incorporate the weather into your Winter wedding day without ruining it. 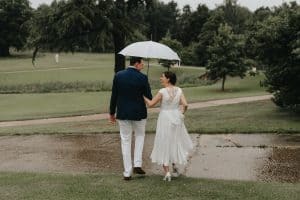 Umbrellas can actually be great props for wedding photographs – purchase one for each member of your bridal party, go outside and dance in the rain! Check out Mr & Mrs Owen’s wedding (photography by S6 Photography). 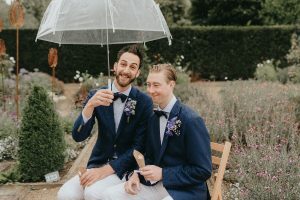 The rain poured on their wedding day, completely flooding their tipi, bar and dance floor, but determined to not let that dampen their spirits – excuse the pun – they gathered outside with their entire bridal party for their wedding photographs and made the most of what would be, in many people’s eyes, a wedding day disaster! The more obvious of Winter wedding tips from me here. 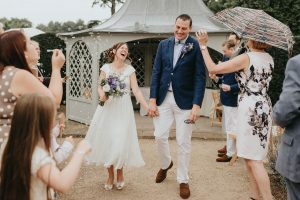 The sun will set much earlier than in the Summer months but a professional wedding photographer will take this in their stride and still ensure you get stunning photographs even if this means jigging your timeline around slightly. Your photographer may also carry speed lights which are capable of illuminating any dark areas. Have a chat with your wedding photographer and ensure they are comfortable with shooting in low light situations and have the necessary equipment. Professional wedding photography is definitely worth the investment, because after all the bedlam, elation, excitement and partying, the two things you are left with are your memories and your wedding photographs. If you would like exceptional images that you can proudly display in your home and show off to friends for years to come, then investing in an amazing wedding photographer will definitely not be something you regret. All of these Winter wedding tips are important and this one is very wise. Plan your timings carefully and ensure you have time allocated for your wedding photographs whilst there is still daylight. It’s often easy to try to conform to a generic wedding timeline that your venue sets out but make your own to allow you have enough time to make the most of the daylight. Although photographs at sunset or illuminated at nighttime can look really effective, if you would like photographs taken in the day then you must ensure you allow time for this because the light will diminish quickly in the afternoon, fading away before you even realise. If you aren’t keen on ushering your wedding guests outside, try and ensure that your chosen wedding venue has an alternative inside location suitable for group wedding photographs. This doesn’t necessarily need to be a big room with plenty of space, even a grand staircase can work well with your guests staggered on the different level of the stairs, try to think outside of the box if you can. Most wedding venues will have storm or floodlights outside and you can request for these to be on as soon as the sun sets. Candles can help add a really atmospheric look to your wedding photographs so ask your wedding venue if you are able to decorate the rooms with candles or even battery-operated candles and tea lights. This will make the rooms feel much cosier and add a much warmer look to your wedding photographs. You can even be as vague as to approach them and ask, do you have any Winter wedding tips that are venue specific? If you do wish to venture outside despite the weather, I’m sure you don’t want blue fingers and a red nose in your wedding photographs; make sure you have adequate clothing suitable for your wedding attire, such as a shoal or bolero for the bride and bridesmaids, or even an awesome personalised leather jacket. If your wedding venue requires walking on muddy terrain or grass, it is best to be cautious and prepare for rain, just in case. After all, a muddy wedding dress is not the kind I’m sure you’ve imagined seeing when you view your wedding photographs. Laying down some wooden board on main pathways could be an option; this will not harbor mud and will be much more pleasant to walk on than muddy grass. One for the ladies – heel protectors. Such a simple, yet ingenious idea, little clear (or coloured) caps that slot over a ladies’ healed shoe, making it easier to walk on uneven surfaces and prevent sinking into mud during bad weather. You can buy these for as little as 99p a pair; purchase a set for each member of your bridal party and ensure your wedding day is sink-free! Despite everything I have said above, the most important thing to remember is to enjoy your wedding day. No matter what the weather, no matter how dark, no matter what goes wrong, in the grand scheme of things – it’s not important. What is important is that you are marrying your true love, and a lifetime of happiness together awaits you both.